The Parish of St Mark's today extends along the steep sides of the Hebble Valley from Stoney Royd in the north to Exley in the south. Above it in the east is the open countryside of Southowram, and in the west the area of Salterhebble and Huddersfield Road. In 1850 Siddal consisted of a few scattered farms and hamlets between Whitegate and Exley. tenements in "the Siddal" and this included the then Siddal Hall, with a Chapel annexed and forty-six acres of land. The ancient Parish of Halifax was one of the largest in the country and was later to be divided and subdivided as the population grew. From the old Parish of Halifax twenty seven new parishes and churches were created after 1820. In the year 1858 All Saints' Church, Salterhebble was erected and Col William Irving Holdsworth of Shaw Lodge laid the foundation stone, a project to which he made generous donations. Siddal was part of the All Saints' Parish and had no church of its own until 1869 when a small mission chapel at Ease was opened on Whitegate in August. This only seated about 130 and after a time proved inadequate for a district with a population that was growing. The church was made of metal and became known by a variety of names - the iron church, the tin church or the tabernacle. The curates in charge were the Rev. E Thring, Rev. H Williams, Rev. H Bull and the Rev. F.O. Warman. The little church was often filled to overflowing and anniversary services had to be held in the schools. The people were enthusiastic and a movement was started to press for a new church. St Mark's Sunday School was built in 1875 by the Holdsworth family, the local textile manufacturers and for many years it was a day school as well as a Sunday school. Parents who worked in the mill paid one penny each week in fees for their children's education. In 1916 Mr Clement Holdsworth and his son Mr George Holdsworth gave the school to the church. During the year that followed the school was a centre for community activities. Soldiers were billeted there during both wars. The building fell into a state of decay in later years and was sold in 1983 and later demolished. With regard to the building of a new church, a great number of years passed before anything tangible was done. Messrs. C Holdsworth, W Tillertson, J Moreton, J Shoesmith. Canon Warneford (in the chair) read letters in respect to a plot of land which had been offered under certain conditions. It was found that the site offered would cost at least £300 to bring it up to building level. The next meeting, held on 15th December 1893 ended in deadlock. A meeting to consider another site was held on 26th January 1894. This site, known as Tenter Field, is where the church now stands. The area was 6,353 square yards at two shillings per yard, and the owner would not sell it in parts, so the amount requested was £635 6s 0d. It was agreed that the site was the best yet offered and resolved that the land be purchased for the proposed church and vicarage. At a further meeting held on 16th February 1899 trustees were elected for the site when purchased. A grant had been made by the Wakefield Diocesan Society of £300 towards the purchase. A long interval passed between the last Committee meeting and that held on 22nd January 1912 at the Halifax vicarage with the Archdeacon of Halifax in the chair. It was agreed that the committee proceed to form a scheme for the building of a permanent church in Siddal. Plans were submitted by the Halifax Architects Walsh and Nicholas, with accommodation for 587 to be taken as a basis. The secretary submitted a draft of a public appeal to be made for subscription and it was decided to make 1000 copies for distribution. Things were now beginning to take shape themselves, and it was proposed that the Siddal members of the Building Committee sit as a sub-committee to prepare details for the sod cutting ceremony and the laying of the corner stone. Canon Warneford, Vicar of All saints' and his successor RF Pechey bequeathed £1,100 towards the building fund. From time to time, chiefly by the efforts of the Siddal people themselves, fresh sums were added. Work was now able to commence and the sod cutting ceremony took place on 27th April 1912 in the presence of a large and enthusiastic gathering. On 2nd November the same year, amid much rejoicing, the corner stones were laid. A book containing a list of money gifts was placed in a lead casket under the corner stone. At that date a sum of £6,000 was still needed for the building alone, without furniture. The fund raising prospered so well, chiefly through the generosity on an anonymous lady in London (who became known as Lady Bountiful) that in July 1913 the committee was able to order the completion of the church, albeit without the tower. Then, in October 1914 the committee received the whole of the £900 still needed to complete the tower as well, from the generous lady. It wasn't until many years later that the unknown benefactor was revealed as being Lady Lilia Boucher of Blackheath, London. The beautiful William Morris stained glass window, depicting the ascension was put in the east end of the church in memory of Lady Bountiful, who did so much towards making the building of the church possible. On Saturday 24th April 1915, the church was consecrated by the Right Rev. Bishop Nelligan DD representing the Lord Bishop of the Diocese. The church was filled; and Siddal became a separate parish with the Rev. F O Warman as its first vicar. 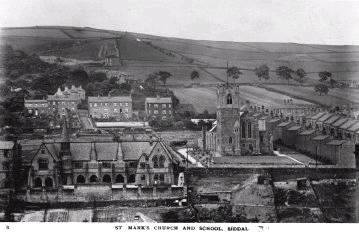 The year 1915 has marked an important step in the life of the church of St Mark's, Siddal. It is no exaggeration to say that the new church is one of the finest modern buildings of its day in the diocese. It repays a detailed examination of its many beauties. Standing on the hillside it presents a bold appearance. The tower with its handsome stonework rises to form a new landmark, and the whole building of the exterior strikes one by its fine properties. The church was built to the design of Joseph Frederick Walsh whose imprint is to be seen in the russet coloured stone. His building of stone coloured with iron salts were well known in the district. The stones were called "insides" because the natural face had a brownish colour which was normally turned to face the inside of the wall. This stone was, at the time, sold at half the price of the same stone with a cut face. Other examples of this coloured stonework can be seen at Northowram Church and the vicarage at Lightcliffe. Mr Walsh died in the year 1950 aged 89 years. On entering the church for the first time, one cannot fail to notice the artistic arrangement of all that one surveys. The late Mr. H P Jackson of Coley was responsible for much of the wood carving. He was a specialist in ecclesiastical carving with much emphasis on the gothic style. The pew ends are worth a close inspection as they bear designs differing from each other. The national symbols of the Allied Countries were incorporated as a permanent reminder that the church was built in the troublesome times of the First World War. There is a fine lectern and pulpit. Two oak panels display the Lord's Prayer, Apostles Creed and Ten Commandments to form part of the rederos, (screens behind the Altar,) which were dedicated by the Rev. P M Weston in memory of the first vicar of St. Mark's, Rev. F O Warman on 11th December 1932. The oak panelling above the organ console was installed in 1971 in memory of Mr Norman Rigg by his wife. The panelling, extending to over 13 feet in length, includes symbols related to Mr Rigg's work in the Halifax Borough Laboratories - a pair of scales, a pestle and mortar and a test tube. Mr Jackson and his father were also responsible for the carvings in the morning chapel, were completed before 1920, and for the altar table. A more recent addition is a carved cross over the remembrance table from the workshop of Robert Thompson of Kilburn, with his "mouse" trademark in evidence. On Saturday 24th April 1926 the Clock Chimes and Memorial Tablet were unveiled by the Right Rev. Bishop Frodisham D.D. in memory of David and Mary Ann Mitchell. Later the illumination of the East Window was by a legacy from Mrs Alice Jennings in memory of her husband Mr Isaac Jennings, an official of the church and head designer at John Holdsworth & Co Ltd.
A Garden of Remembrance was consecrated on the south side of the church by the Vicar of Halifax, Archdeacon Eric Treacy, later to become the "Railway Bishop" on Sunday 29th October 1957. A War Memorial on the west side of the church in memory of the men of the village who were killed in the Great War was unveiled by Col. Sir E N Whiteley O.B.E. on Sunday 18th February 1923 during a violent storm. A plaque, in memory of those killed in the Second World War was unveiled by Capt. T Keighley R.A. after the end of hostilities in 1945. A Remembrance Book and Cabinet were placed in the south side aisle of the church. Since the sale and demolition of the Sunday School, meetings were held to discuss the re-ordering of the church. After much discussion as to the best use of the premises, it was finally decided to make alterations to the west end of the church in order to provide a hall, lounge, kitchen, toilets with meeting rooms above. This work took longer than planned, and resulted in meetings and youth work taking place in the vicarage or church vestries at the time. A service was held after the completion of the work on Sunday 29th April 1990, when the Bishop of Wakefield officially opened the new church centre, on the 75th anniversary of the church's opening. After a period without a vicar, in January 2001, the Rev. Christine Smith, curate at All Saints', Salterhebble, was appointed Priest-in-Charge. Christine then moved to Todmorden in 2007.